famous capybara Caplin Rous is horrified. I was quoted in the LA Times this week in an article by Lindsay Barnett. Normally this would make me very excited and happy but the topic of the article brings much stress to my little capy heart. I am so worried about my wild cousins. It’s not like they don’t have enough to worry about with anacondas, jaguars, crocodiles, caiman, piranha, cars and humans hunting them for local consumption. Now my relatives in Bolivia are going to hunted and exported (dead) to Venezuela. I don’t think this is a good idea, and not just because we are adorable, smart, affectionate animals that would be much better appreciated alive. 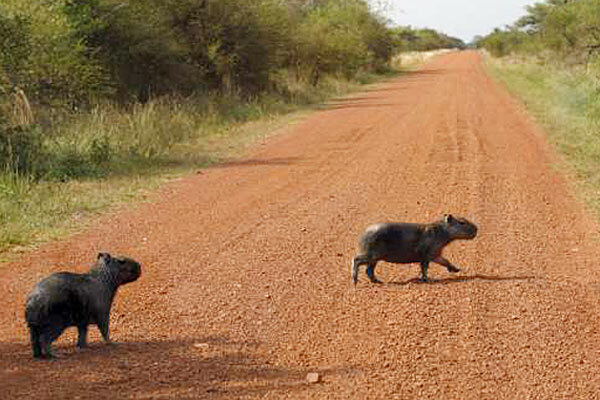 Hunting capybaras will naturally make them much more reclusive. It will get harder and harder to spot them in the wild, even if their numbers don’t decline. As I said above, we are smart animals and we will figure out what’s going on in no time. This will hurt Bolivia’s ecotourism industy since ecotourists like it when they can see animals, especially large, cute animals like capybaras. Also, capybaras are being ranched in Venezuela. It would be better to encourage that rather than importing animals from elsewhere. Ranching is (hopefully) done in a sustainable manner. The ranch owners have much more at stake in maintaining the local populations than hunters do. Sadly, hunting has greatly diminished our numbers, or even completely wiped us out, in large areas of our former range. In some ways humans are smart but in others they are really slow learners. I hope they don’t learn too slowly for my wild cousins to survive. Oh, and I wish people would stop saying that I should be in the wild! It’s starting to make me mad. The wild sure isn’t what it used to be.